The Seattle metro has enjoyed strong job growth in recent years and soaring housing costs. Developers have responded with a multiyear construction boom that started in about 2014. As high-rise condo and apartment towers have been sprouting like mushrooms, “crane counting” has become a thing. Now there is the prospect that the new supply is outgrowing demand, and that this supply is mostly high-end, further crimping demand for those units. Over the past five years, the new supply of apartments in buildings of 50+ units averaged 9,236 apartments per year. And demand? Over the current 12-month period, occupancy in the segment of those buildings increased by 6,816 units. So vacancy rates are rising. And there are a lot more units coming. “With Absorption remaining rather steady, however, as we are headed for the seasonally challenging 4th quarter soon, we are anticipating a potential hike in vacancy,” Apartment Insights writes in its Q3 report. “Stabilized”: the vacancy rate that includes only buildings where developers have largely succeeded in renting out most of the units. This vacancy rate does not include projects that have just come on the market and that are still largely empty. And the vacancy rate of all big projects that have been completed, whether stabilized or not. This is a significantly higher number. Generally a leading or contributing leading indicator of the market, Rents Net of Concessions (NR), collapsed this quarter by 128 basis points. Interestingly, this is the second time in just one year that this metric has fallen by over 125 bps from quarter to quarter. It is hard to imagine that this is the new normal for NR, as this level of volatility has not been seen in this fundamental measure before. Perhaps we have entered a new plane for volatility levels of NR that have likely been introduced by rent pricing programs, and the stress on demand exerted by elevated levels of new supply. Thus, we may anticipate a slowing in Absorption in the near term, and using historic norms we would experience an increase in occupied units of only 2,895 for the coming 4th and 1st quarter of 2019. Given that we predict estimated dates for when projects under construction will open, we can, therefore, estimate the Vacancy Rate for All Properties as of the 1st quarter of 2019. This growing vacancy rate is occurring despite Seattle’s hopping economy and employment growth. No one at the moment is figuring into the scenarios that there might ever be an economic slowdown, despite rising interest rates designed to produce one, and that this employment boom might ever subside, or reverse. Yes these newly constructed apartments are high-end because of the high cost of building materials. They don’t build apartments for the median wage earner or the middle class. Also, I rented a 2br apartment in the Multnomah Village neighborhood of Portland Or for $735 a month back in 2010. The same apartment now goes for $1800 and it’s not new. New ones in that neighborhood rent for $2500-$3000 a month. How can student-loan-debt-strapped millennials afford $3000 a month for a 2br apartment in Seattle unless they pile in with a bunch of roommates? That means putting off marriage and family which will further exacerbate the problem. High rent and home prices are not an unintended consequence. Asset inflation was the explicit Fed goal during QE and ZIRP. Would liquidation of bad debts have been better in 2008/9? I wonder sometimes. I don’t have to wonder whether taxpayers should pick up the tab for a greedy lender that made a bad loan to a greedy borrower. In my mind, the only real question is whether they should be given some scraps at the food shelter. 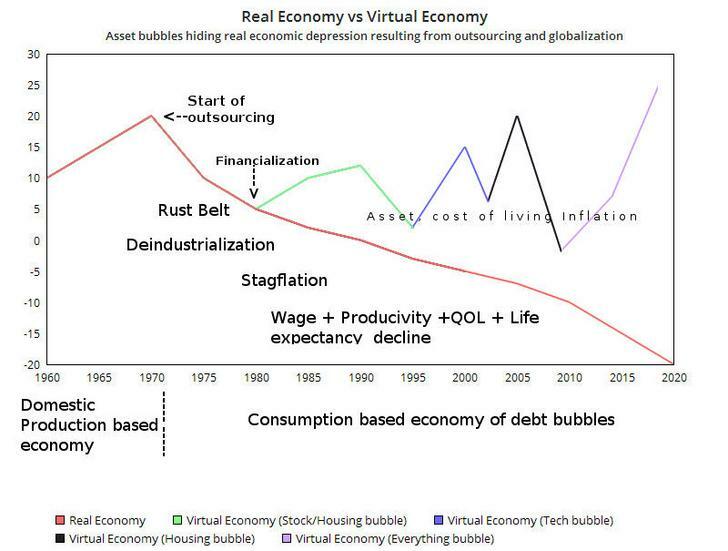 Asset inflation has the same effect on the economy as shovel-ready jobs. However, they don’t benefit the same people. Yikes, that’s not quite, but closing in on SF prices. Basically this almost require a two income family. This obviously can’t last. Wonder how much the down side will look like and what’ll happen to these places when the vacancy rates finally get unacceptable. It also means that many will be attracted to lower cost areas and others who may have taken first jobs in Seattle will no longer go there. Most of the so called high end apartments in Portland I have seen have a lonely mitsubishi hi-wall ductless ac in the living room and cheap cadet wall heaters in the bedrooms. Hard cold floors and excruciatingly slow elevators. Bi weekly fire alarms and evacuation. Echoes of bum fights late at night. These LEED certified bla bla etc buildings in Portland are crap. Don’t beleive the hype. Cheap construction everywhere. Granite granite countertops are common though. So there’s that. The apartment that was $735 and is now $1800 might be the same unit number, but it probably is not the same apartment. After $50,000 to $75,000 for renovations, it is not the same unit. These vacancy (not yet rented) stats are interesting. Does anybody maintain a measure of how many of these units are straight-up empty, owned but not used or available? Which also shows access to newbuild is for top 18% of households. . Which is not very current. … should be some reliable and continuously updated source page somewhere I imagine ! How could such tiny concessions, like one free month, attract potential tenants. If an apartment rents for $3000/month and you get one free month that only lowers the monthly rent to $2750/month. I don’t see how someone willing to throw these huge sums of money around on rent would care about such a small difference – after all they’re obviously swimming in more money then they know how to spend so why should they care about $250/month in savings? Also, Jeff Bezos likes to keep his employees pushed to the wall and terrified (he recently said he wants everyone of his employees to wake up terrified everyday) so it’s not hard to imagine they do a lot of firing over there at Amazon to keep the rest of the herd terrified. What happens to the poor slobs, who move up here for their big Amazon gig, only to get fired after a few months and they’re unemployed and stuck with a rent payment of $36,000/year – hopping over to Starbucks won’t cover that nut (and neither will a Microsoft gig). Myself, I’ve become quite accustomed to living in a van, I may sound miserable but I’m not, so greedy developers can go to hell. Don’t be homeless instead plan and organize your life without a fixed roof and live home-free. With proper planning you can keep from falling apart, no one would guess you don’t have an apartment and your life can not only be free but also enjoyable when you no longer work for your greedy landlord. One month free can lower the price below similar units in an area. I took a similar concession last year. But you must do so knowing you may have to move the next year because they will base your next lease on the per month price without concessions. I actually had my rent increased on top of my monthly rent and told them go take a hike. A week before move out, they came out and said I could stay for $50 less than what I was paying, but still an increase of my average rate with the concession. I had already signed a new lease and left. They plan on most people not leaving and most won’t want to year after year. Van life is hip now. Seriously, I’ve considered the lifestyle. It’s something to be admired with millennials. I read “Nomadland”, surviving America in the 21st century. 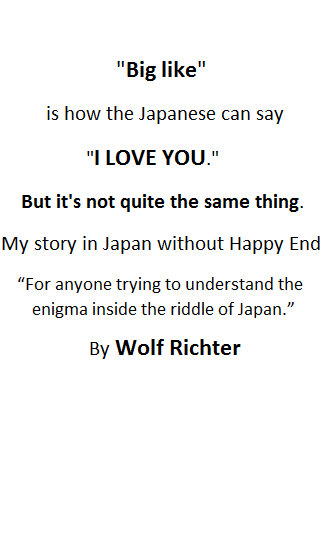 It opened my eyes. And it is not just young people doing it. Here in San Francisco, an option (if you are lucky enough to get one) is an SRO or single room occupancy. These are ‘hotels’ with tiny, dorm style rooms and communal kitchens and bathrooms. They may be the future for many people. Right now an SRO can rent for $1300/mo. and more. These are often old buildings but maybe new ones will be built as people just give up on requiring personal space. Sadly, almost all of the SRO’s were torn down, under the principle that “you will live like a yuppie or you will live in the street” that’s prevailed since the 1980s. SRO’s are often fondly referred to as “piss in sink” hotels, since while there’s a communal kitchen and bathroom with showers, there’s a little sink with a mirror in the room. You can figure out the rest. They’re perfectly fine for single people and in the past, these and “flop houses” kept all but the most dysfunctional off of the streets. I believe this will affect home values as well. There are a ton of mom-and-pop landlords in Seattle who purchased homes specifically to rent them out. They’ll be the first to sell if (when) monthly cash flow goes negative. It’s not like the resident home owner who has to think about where they’d live if they cashed out equity. A landlord will sell the minute they think the top is in. as one gets older it seems less is more. Amen. That’s certainly true. Plus, one floor is a must if one has joint problems, etc. I have a small rental I designed solely for a friend of mine who is 78. He has worn out hips and knees from a hard working life. He should be good for awhile. Vancouver refugees/seniors are buying homes on the Island with 2 and 3 stories. How dumb is that? Good to see some REAL rental supply and vacancy projections from Seattle. The population in non-census years is estimated by assuming that all existing housing units, including all those newly constructed ones, are filled at the same occupancy rate as was found (by actual counting) in the last (that is, 2010) census. So there is a circular circle-jerk of numbers that say that there is a high occupancy rate (and low vacancy rate), because the population grew, because (you guessed it) all those new units are ASSUMED to be occupied already, and at the same rate and household size as was the case in the 2010 census. I have called this the FIB methodology, which stands for “Filled-If-Built”. It is both an acronym and a pun. Another acronym I have used is BIFF (Built-Is-Filled-by-Fiat). But known and very significant limitations do not stop the bubble-mongering propagandists from abusing the numbers for their own profit, claiming large populations gains, shortages of housing, etc. 2014-2015-2016-2017-2018 is 5 years, but donl’t worry, it is a common mistake. I live in an apt in Uptown Seattle (landlords have opportunistically called it Lower Queen Anne). An email (below) just hit my inbox tonight regarding the switch to short term rentals for a unit in an adjacent building, which from my naive, out the back window, observation, appears to have had a lot of trouble renting out units. Asking rents for the 2+2 units referenced below with 12 month lease have been >$3,000 per month (~1,000 sq ft). aaand, if you’re an idiot, please sign here and never worry about money again, this is your last chance! This is all part of the building cycle. When Housing is in shirt supply, developers start new projects and rents come down, and the projects slow down. Changes in demand are met by a delayed change in supply,, but you cannot extrapolate that rents will go to the sky when demand is tight, and no, rents will not go to $100 in the current downturn. 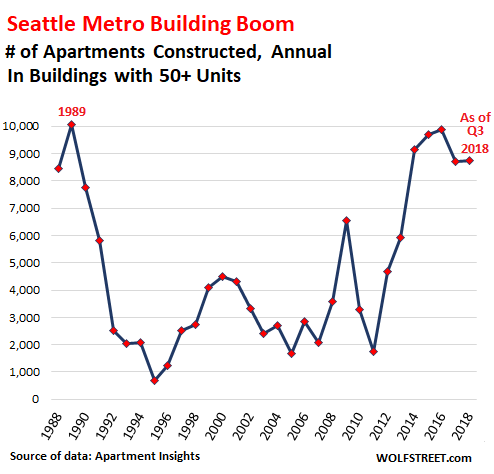 Seattle is in a down cycle on rents, but five years from now, they are likely to see a reverse of the cycle, and “rents will head for the sky”. What is the annual population growth of Seattle Metro? Apparently not enough to fill the vacant apartments. Also see my post about OFM FIB-numbers above. Years ago, rent control was a major issue in NYC. Many rents were fixed at a reasonable rate. Why is it that in today’s world, no one complains about the absence of affordable rents? Have people changed or the politicians? Most rents have doubled in the last ten years (even in backwaters!). > Most rents have doubled in the last ten years (even in backwaters!). When stock prices drop Seattle will be hit very hard. A high percentage of salary is paid in stock. The good RE and rental market has been driven by rising stock prices over the past four years. Take Amazon, for example. How will Amazon pay its employees if its stock price levels off or drops? At a $1T market cap, I think Amazon’s stock has little upside from here. Yet, they’ve been working their employees pretty hard at the headquarters. The culture is unsustainable. Employees put up with it for reason – the rising stock price. Amazon has been the biggest employer in Seattle by far. What happens when they channel new hiring to the 2nd headquarters? 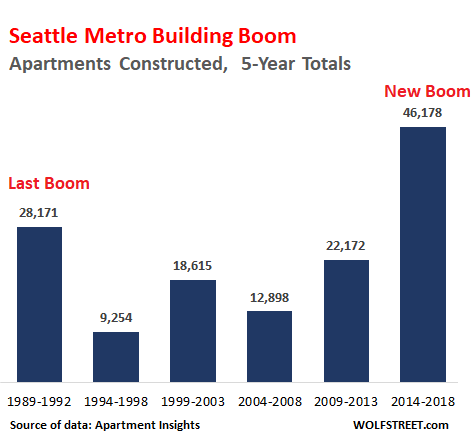 The growth in Seattle will take a big hit. Apartment owner would rather have over 10% vacancy rates than accept steeply lower rates. They view new renter incentives (free month or two) as marketing costs and not drops in overall rental rates. Good point. It is ‘ideal’ from a wear-and tear perspective to have as few units occupied as possible. I think this may the new model for rentals as many apartment complexes aspire to be ‘condo-conversions’. Condo conversions were very common in So. Cal, years ago, although I’m not sure if it’s still a thing. Many former 1-bdr/1 bath 600 sq ft apartment complexes in San Diego are now on sale for about $325,000- $350,000 per unit. Like most So. Cal apts they have paper thin walls and ceilings. Uhh, and that’s not a typo on the sq-ft or the sale price. The thing that interests me in all of this is that the infrastructure in cities like Seattle is not geared to absorbing another 10,000 residents yearly. I have lived in every major metro area on the West Coast and seen traffic and every other service get worse as the years go by. It simply takes too long to get a project approved, too much to finance them once approved, and way too long to actually build them. There’s a limit to the space available, and limits too how that space can be used. I5 through Seattle is essentially a one lane road, and has been for over 30 years. There’s no way to improve that without tearing the whole thing down and starting over; and that’s not going to happen. Tacoma has a really beautiful new development called Point Ruston aimed at those millennials. There are around 300 new apartments with plans to double that as well as a couple new developments within a mile. The developers don’t tell the buyers this was a Superfund cleanup site 30-40 years ago. (We all know how well cleaning toxic materials from groundwater works.) The kicker is that there are only two roads into the area, both limited to one lane in each direction and with no way to widen them. Prices start at $1500/mo for a Studio. Another popular undertaking around here is the purchase of an older home on a larger lot (1/3 to over an acre) and stuffing as many multistory homes on it as possible. The small town I live in (which has no place to expand) has seen an increase in residential units of over 25% in the past 20 years, most of that in just the past 10. There has been no increase in road construction, drainage, sewer, or power generation. These are hidden costs that fall back on the taxpayers after the developers have gone home. What’s missing in this discussion is the exceptionally high turnover rates at Amazon, Google, and the other tech giants driving the new economy in Seattle. We just hired a former Google employee who said that the average term of employment at Google appeared to be about 1.5 years, at Amazon it’s barely 2 years. So, much of the new hiring is an effort to stem the bleeding of talent that’s fleeing once they have checked the Google/Amazon tick box on their resume. Many of those leaving are moving out of Seattle, siting horrible dreary winters, apocalyptic traffic, sky high rents, overly expensive everything (from the shockingly mediocre food scene to drinks often 50-100% more expensive than Manhattan), not to mention a public transit system that is a national embarrassment and a delusional city council that has gone to war against cars. This will not end well for Seattle. City Hall has for too long relied on the deluge of cash from fees and construction to fatten it’s budget. Soon many of these new towers will see their tenants wooed by new developments desperate for cash flow to service debt. Developers do not want to risk converting to condos, as the laws in Seattle that hold developers liable for construction defects makes that a particularly bad option till a building can be sold after some years (https://www.washington.edu/news/2016/07/28/runstad-center-report-addressing-condo-construction-defect-liability-may-help-promote-affordable-housing-in-seattle/). This all adds up to a bad scenario for many of these debt saddled companies who own towers in a city that could soon see 30-40+% vacancy rates in the downtown core. Rents will plummet as some on the brink get desperate, the knock on will directly impact housing prices, and the County Assessor will be faced with having to down-value properties throughout the region. City and county income will collapse, and with crumbling infrastructure an increasing problem.. you can see where this goes. By 2022/3 I expect to be able to swoop up property in Seattle for bargain prices, if I even want to continue living here (and after 40+ years, there’s a real question about that). If I do, it will likely set me up for an early retirement in about 12 years once people’s short term memory fades and the whole ridiculous cycle repeats itself again.